Readings: A slick way to read articles by any author or publisher. GReader replacement? Readings is a super slick site that lets you follow news from any publisher or author and read it in style. 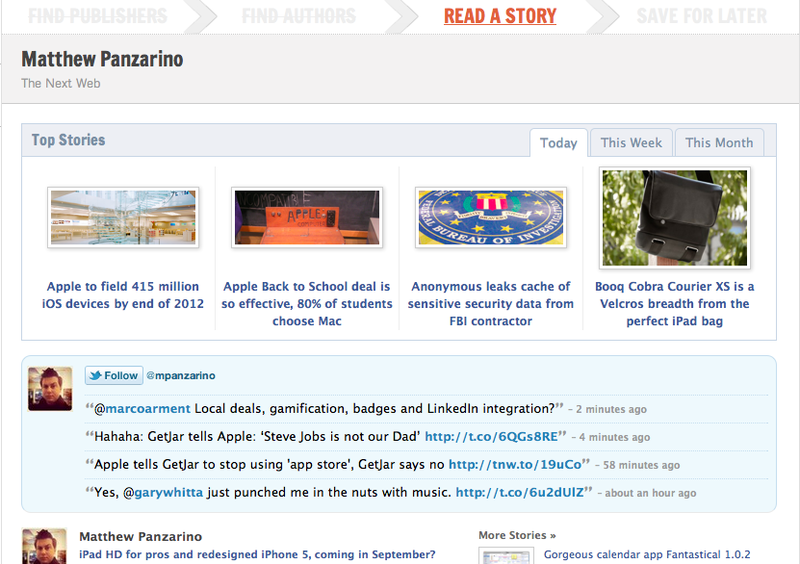 At first glance, it’s sort of like Facebook meets Google Reader, but it looks much better than either one. The basic concept is that you can choose to follow a publisher, like The Next Web, or an individual author, like me! Then, Readings will go out and grab the content from that publisher or writer and display it in a clean, easy to read digest style. You can sort by time, plow through articles in groupings that are sorted by popularity and save items for later reading. One of the coolest things about Readings is that, if you follow an author, it will show you all of the content available for that person, regardless of what site they wrote the articles for. This is a great way to read everything that your favorite author writes even if some of it is on sites that you normally don’t visit in your normal routine. Readings displays pictures, text and video in a clean, reformatted UI that gives you easy access to stories without the clutter. The stories are automatically curated to filter in the top stories from a publisher and you can easily search content from within your sources, allowing you to get your favorite sites’ take on a topic, rather than being inundated with every result from Google. I’ve only been using Readings for a short time, but I’m impressed so far. I can already see recommending it to people that are interested in seeing everything I write, (hi Mom!) without having to manually go to a site and click on my name to get a list by author. We’ll be back with a deeper review shortly but for now, Readings has just entered public beta so you can head on over to the site now to check it out. You can start reading and playing right away but if you want to save items for later, you’ll have to create a login.